Getting out on your bike can be a really fun and rewarding adventure! There are also many physical and mental benefits to be gained from frequent rides! At The Insurance Emporium, we love getting behind the things people are really passionate about. Which is why we’ve come up with 10 health benefits of cycling that might encourage you to get in the saddle! It’s probably the most obvious item on this list, but exercising more could help you shed some pounds! Cycling is a low impact activity, which might make it easier on your joints than some other types of exercise. Getting on your bike could be the way to put the brakes on heart disease! Regular exercise might help reduce blood pressure, increase good HDL cholesterol and decrease bad LDL cholesterol. All of which could lead to a happier heart! 3. Grab an immune boost! Cycling might help boost your immune system! One advantage of moderate exercise is that it can make your immune system more active. The greater the activity, the better your immune system could become at fighting all those nasty infections! …be happy! When we exercise our bodies produce endorphins! This hormone creates a “natural high” that could help reduce stress. Physical activities, such as cycling, might also take your mind off your worries, potentially leaving you feeling much calmer. Cycling could help keep your brain healthy! Aerobic exercise, such as cycling, increases your heart rate, which in turn increases the amount of oxygen in your brain. It might provide just the boost required to cultivate that grey matter! 6. Put some muscle in it! Riding your bike is a great way to build muscle, especially your quads, calves and glutes! This is due to the resistance work involved in pedalling. For a more full-body workout, you could try cycling standing up every so often to get your upper body and arms involved too! Regular cycling, as with all exercise, might help you get a better night’s sleep! Scientists still don’t know the exact reasons for this, but have found it could help people with insomnia. Possible reasons might be because it could ease stress, might decrease sleepiness in the daytime and help you get to sleep more quickly. 8. That’s what friends are for! Joining a cycle club could be a great way to meet new people and share your passion for riding! Plus, if you turn cycling into a social event, it might also be a great incentive to ensure you stick to your biking dreams! 9. It’s a family affair! If you love cycling or would like to get started, why not involve your family? 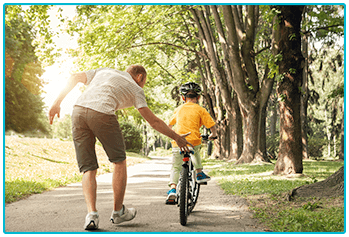 Going on bike rides together could be a great way to get your kids exercising from an early age. It might also make riding a bike more fun for everyone if there are other people involved! Sounds wheely good to us! 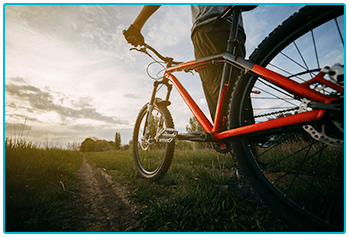 No matter if you’re a seasoned cyclist or looking to dust off your old bike, cycling might be a fantastic way to improve your health all round! 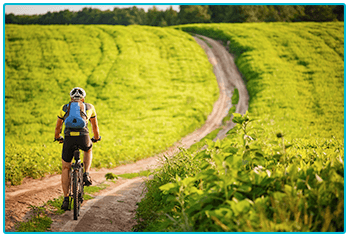 When planning your next adventure, it could be a good idea to consider insuring your bike to give you real peace of mind. At The Insurance Emporium, we offer up to 25% discount on new policies*, as well as Elective Benefits for Public Liability and Family Member Cover. Ride on down to The Insurance Emporium to find out more! * The 25% discount is made up of 15% Introductory Discount, plus 5% Age Related Discount and 5% Security Discount (if appropriate). The 15% Introductory Discount is available for the first 12 premium payments on lunar and calendar monthly policies or one premium payment on annual policies.